For all of you hipsters out there who've purchased Nirvana tees from Urban Outfitters, but have no idea who Kurt Cobain is, Brett Morgen has created a beautiful explanation for you. The gut-wrenching trailer for his upcoming documentary, Montage of Heck climbs from Kurt Cobain’s early years, through intensely private moments with his daughter, and culminates in shots that foreshadow his ultimate disassembly. Montage of Heck has already received rave reviews at Sundance and will premiere on HBO on May 4th. Nothing is more fitting for Friday the 13th than Charles Atlas’ peculiar short videos. Atlas is best known for being a leading figure in developing media-dance; a genre in which original performance is created specifically for the camera. His early collaborations will be screened at Ooga Booga tonight in Los Angeles followed by a book signing and discussion with the artist and Laurie Weeks. In a clever victory for 4 letter named consumption, WOAW the Hong Kong lifestyle concept store has teamed up with L.A.-based gallery HVW8 to present a new photography exhibition, that showcases the works of legendary skate photographer, Atiba Jefferson. The works, collectively called “Lonely Wanderer” will be shown at the WOAW pop-up store, starting Monday, March 16 in Hong Kong. Talk about a cliffhanger. British artist and sculptor Richard Wilson has created a full-sized replica of a vintage twin-axel Harrington Legionnaire coach, and conveniently parked it on the seventh floor of the Peninsula Hong Kong. The teetering bus titled “Hang On A Minute Lads...I’ve Got A Great Idea” was inspired by the final scene in the 1969 film The Italian Job. Wilson’s visual heart attack celebrates the beginning of the Peninsula’s three year collaboration with the Royal Academy of Arts. The car will be on view until April 8th assuming parking enforcement doesn’t arrive beforehand and ruin everyone’s day. Misery loves company, and we love Lion Babe. The Electric R&B duo sounds like the beats of XXYYXX met and were mixed with an actual singer, instead of taken from 90’s girl-group samples. Lion Babe is a NYC native band comprised of the stimulating and empowered voice of Jillian Hervey and the slow melodic beats produced by Lucas Goodman. They are currently touring the U.K. after signing with Universal Records and releasing their debut EP. Check out the video for their first single, “Treat Me Like Fire” here. Art and advertising were conflated long before the poet Lew Welch wrote Raid’s famous tagline: “Kills Bugs Dead.” Now, Danish actor, Mads Mikkelsen (Profiled in issue #136) is starring in the 6 minute short film, The Call, for furniture store BoConcept. The video is a classic ménage à trois scenario, in which Mikkelsen’s character’s wife, Swedish actress Malin Buska, cooly sips on white wine as her husband converses with another woman on the phone in French. Whether you’re just furniture shopping, or looking for a 6 minute thriller, the film is worth watching. Hillary Clinton strikes again with a sappy political video. Unlike her (in)famous “3 a.m.” video, though, this one actually strikes a chord. Titled “We’re Not There Yet,” the short was made for International Women’s Day, and addresses gender inequality by having famous actresses’ voices list ways in which women are still marginalized in the U.S. and around the world. With a new “gender-neutral pop-up department” in the works, Selfridges is teaming up with The Sartorialist to find and spotlight London’s best androgynous street style. As part of their Agender campaign, which includes a film you can view here, the department store is holding an open casting with Scott Schuman in London today. A chosen few of the best gender-bending looks will be photographed by Schuman and featured on Selfridges’ website and social media. Androgyny suits you, Selfridges. Those of you worried that “Kimye” was making Yeezy a little too mainstream can let out a sigh of relief: Kanye has released a “zine,” so that he can gain some traction with the underground hipster scene. In collaboration with photographer Jackie Nickerson, the so-called zine, titled Season One, downloadable here, features no text, but does include ample photographs of naked women and numerous pieces from Kanye’s Adidas line. Basically a lookbook, it’s no wonder this zine has people talking (and laughing). The new “Masterpiece” app from the same creators of Osmo literally transforms stick figures into Picassos… oh wait. Osmo is an Ipad accessory that takes real life objects and turns them into drawings, allowing users to “trace” their subjects by watching the screen while drawing on paper. Who was it that said paint by numbers wasn’t art? Sure, Tali Lennox can walk the (cat)walk, but can she paint a portrait? Apparently so. 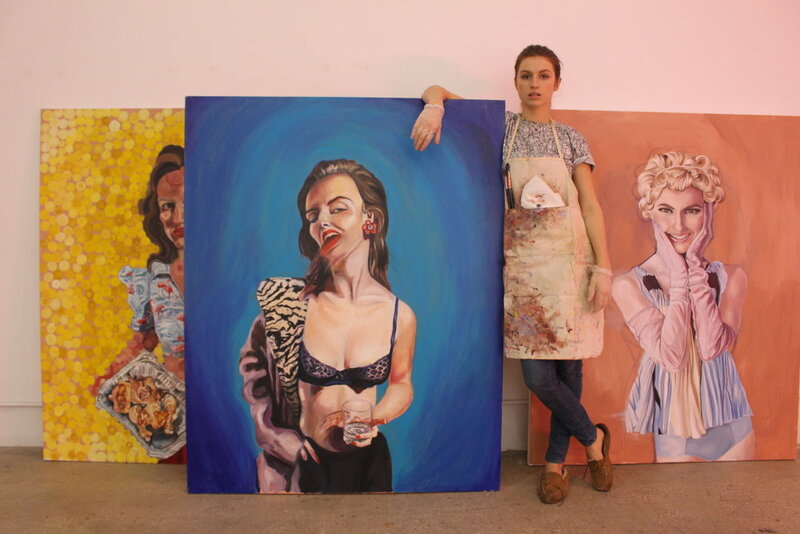 The Brit model ditched the glam life for the gallery life and is living as the artist-in-residency at Catherine Ahnell Gallery. Lennox still occasionally models but she is directing her focus on her upcoming solo show “Layers of Life” opening on March 19th.